I’ve been feeling a little under the weather recently and combined with the fact I’m not back to university for another few weeks, it means I’ve had a ton of free time. So I’ve had plenty of time to spend online, looking at the new fall collections that have arrived into stores over the last few weeks. It’s definitely made me wish I could buy an entirely new wardrobe in gorgeous burgundy and neutral tones! 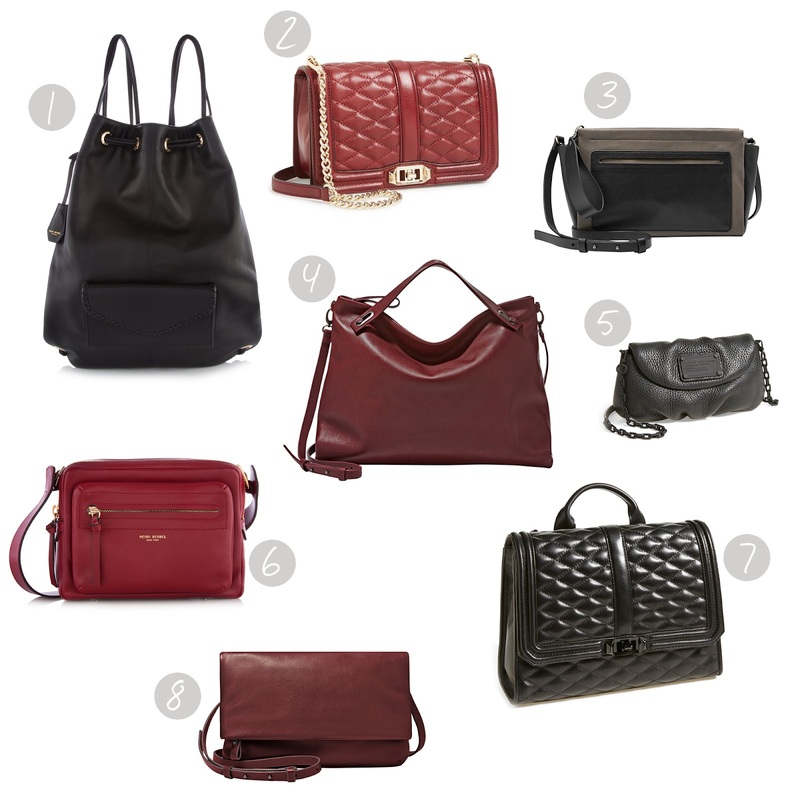 I’ve picked out a few bags that I love and feel are right on trend for this season. Who knows, maybe I'll bite the bullet and add one of these to my collection in the next few weeks. I really shouldn't but I probably will. A girl can never have too many handbags! Let me know which one is your favourite! In Henri Bendel's classic buttery soft leather this is the backpack of my dreams. I adore the minimalistic style of this and the drawstring top. Seriously dreamy. If Henri Bendel delivered to the UK I would purchase this in an instant! For those of us can't quite justify spending so much money on a Chanel Le Boy bag, this is a perfect alternative! I'm absolutely smitten with the Boy bag and I've been eying up this similar one by Rebecca Minkoff for a few months now. I love the quilted effect on the front of the bag and it looks even better in burgundy although it is also available in black! When did Skagen start doing handbags!? Is this a new addition to the brand or have they always done them and I've just never noticed? I'm a huge fan of their watches, I actually own three, so I was very excited to come across their bag collection! I love the innovative style of this bag, not only is it cross body, it also has a wristlet strap so you can use it in a multitude of different ways to suit your outfit. How useful is that!? This bag also comes in a variety of colours, I particularly loved it in 'Grey Steel' as shown here but truthfully every colour looks just as gorgeous! I think I can safely say this bag was 'love at first sight' for me. Like the 'Dorty' it also has a selection of ways to carry it; as a cross body satchel, using the top handles on your arm or as a large clutch. I love the simplicity of this bag and the slouchy nature of it. Again it is available in a variety of colours, all gorgeous, however I've fallen in love with it in 'Wine'. I've already convinced myself not to buy it at least twice today! This bag differs from the classic MBMJ range in that it has blacked out hardwear and boy, oh boy is it gorgeous! All black outfits are perfect for this time of year (anytime actually) and bags with black hardwear definitely add that a little extra edginess. It's the perfect size for slipping your phone, keys, cash and a lip product into! For anyone looking for an all black bag for Fall, this is the one for you! This is my ideal little red bag for Fall. With it's perfect size, two zippered closures, multiple interior pockets and exterior zippered compartment, whats not to love? The 'Dark Red' colour has just the right amount of depth to it, this would look great with so many outfits. Once again, if Henri Bendel delivered to the UK I would already own this! The backpack version of the burgundy cross body bag I included above. I feel backpacks are going to continue to be hugely popular over the next few months and I love how this one looks! I feel like this would be the perfect partner to distressed denim or any form of leather. It's super sassy, edgy and just perfect in my opinion. Another Skagen bag, I feel like they might be my new favourite brand. This one comes with a detachable cross body strap or can be used as a clutch. I love it in 'Wine' the same as the 'Mikkeline' bag but once again in does come in a variety of colours. I feel like this is a perfect bag for everyday use that is perfectly minimal, it makes a statement without being too flashy with glitzy hardwear. Such great picks! 3,6,8 are my favs! I love the Marc Jacobs crossbody! Great post. Fab picks!!! Love all the burgundy! Would you like to follow each other on GFC?! Let me know on my blog and follow me, I will follow you back asap on both GFC and Bloglovin! I love these, but that Kate Spade bag is perfect, and may or may not be in my shopping cart now! Love the Rebecca Minkoff cross body! Great choices! The Rebecca Minkoff one is perfect! THE MERCER CROSSBODY. My goodness. What a dream camera bag! I love this post :)Number 3 is so stunning! My favorites are nº2 and 8! Great picks! Number 2 is the best! I love# 2 bag. It's just gorgeous. Would you like to follow each other? i do need a new fall bag!!! I absolutely love all of these, such an amazing collection!